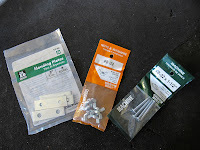 I went to Lowes and bought a couple of packs of 2"-34 mending plates, #8-32 wing nuts and #8-32 x 1-1/2 machine screws. 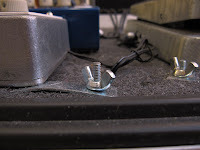 I then attached the brackets to my pedals using the screws already there underneath the pedal housing (most pedals have four of them). 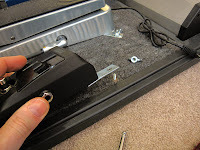 You only need two brackets for most pedals, and only one will suffice for the smaller, lighter ones. Once I had the brackets attached I placed the pedals back on the board, lined them up exactly how I wanted them and then marked the holes for drilling. 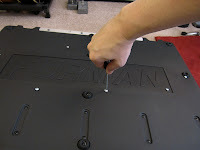 I used my DeWalt drill and a 1/8 inch drill bit, which is a smaller diameter than the machine screw itself. This helps give the screw s ome bite and keeps things nice and tight. Warning: Be sure to use something underneath the board lest you drill a hole in your floor! 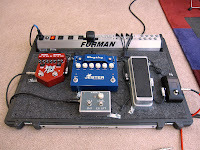 I used a small length of 2x4 that I moved around under the board when drilling the holes. 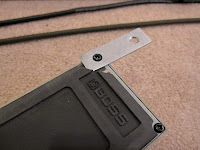 Then I just inserted the screws from the bottom with a screwdriver and the board was ready. The last thing left to do was to put the pedals back on and install the wing nuts. Viola! 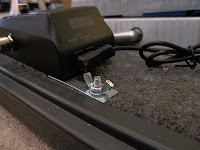 Now your pedals are secure and ready for gigging.